I woke up after a much better night’s sleep with the morning sun blazing in through the windows. I got the shock of my life when my phone told me it was minus 4.7 degrees out there – it was pretty hard to believe from my cozy bedroom upstairs. I was beyond relieved that there were no hypos to deal with overnight, only having to get up once to pour some water down my sore throat. Thanks to Canberra’s unbearably freezing mornings, we’ve been going out for late breakfasts, doing touristy things during the afternoon and then dinner. Eating two (larger) meals instead of my usual three has helped to compensate for all of my holiday eating. I have more time to digest and burn off my large brekky before dinner without squeezing in an unnecessary lunch for the sake of it. I woke up to an 11.0 this morning. Not great, but understandable given the big plate of Pasta I had for dinner last night (which tends to cause a delayed rise). And by my holiday standards, excellent! But the better news came later this afternoon – a gold medal-worthy 4.5. I’ll definitely be keeping this up for the rest of the trip! 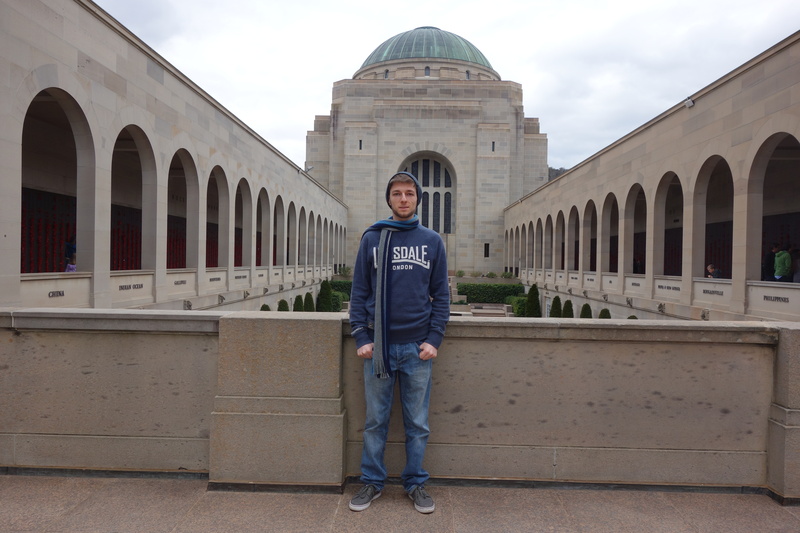 Today’s highlight was visiting the Australian War Memorial in Canberra. There was an outside memorial area, honouring all of our fallen soldiers. 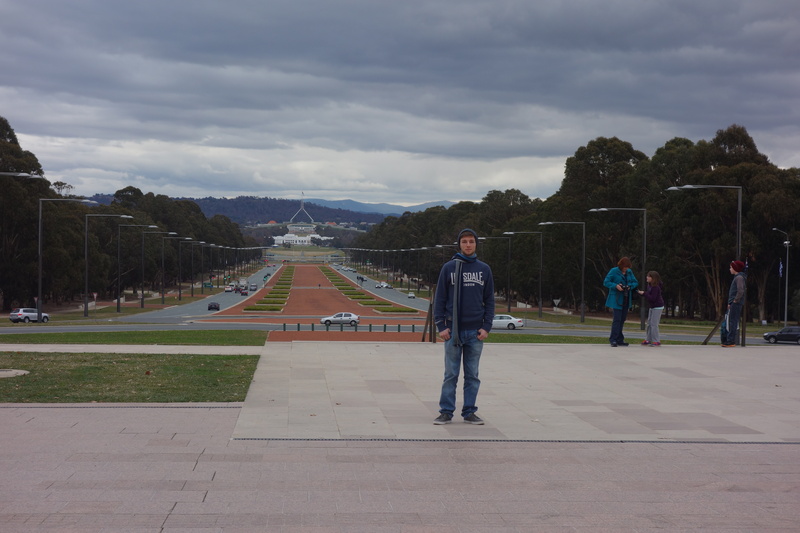 There was another beautiful view of Parliament House opposite it in the distance. 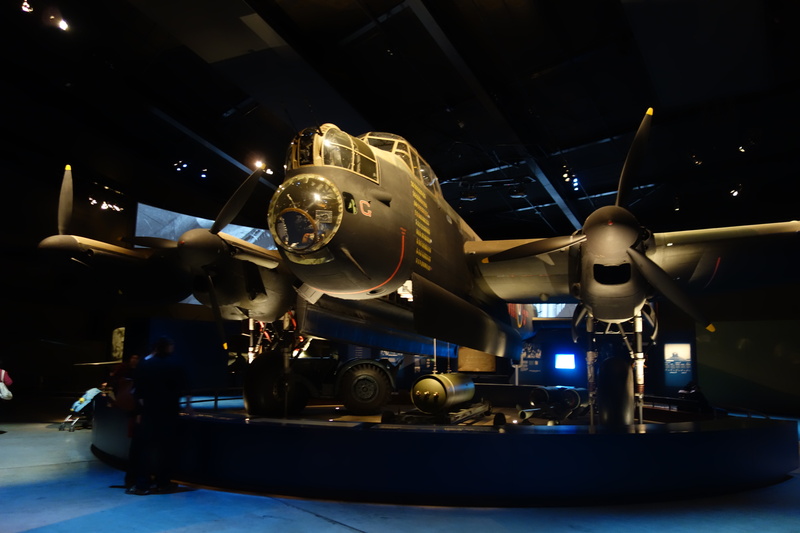 The museum inside was full of artefacts from the wars that Australia has fought in. I don’t have the longest attention span, but you could definitely spend hours there pouring over all the exhibits. Some of the aircraft and machinery there did grab my interest and gave me some good photo challenges too. 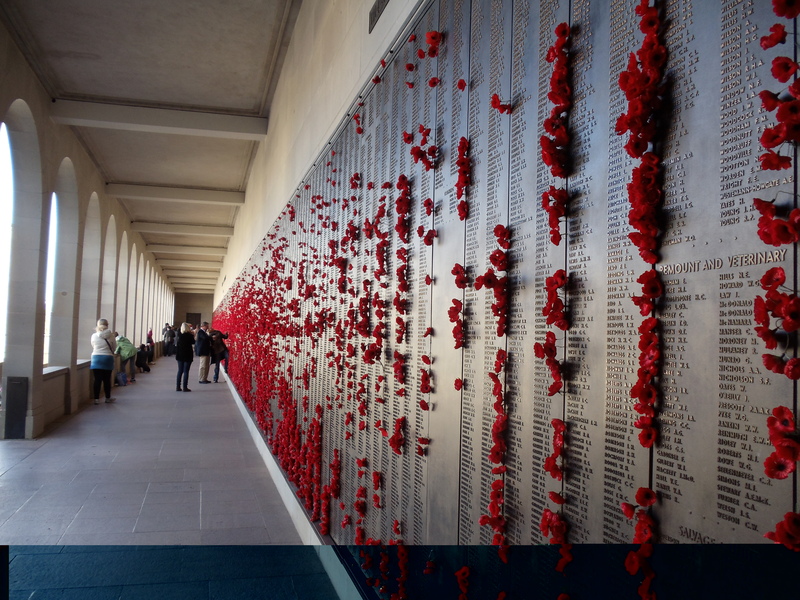 Not really diabetes related, but the War Memorial is a rich piece of our Australian history. 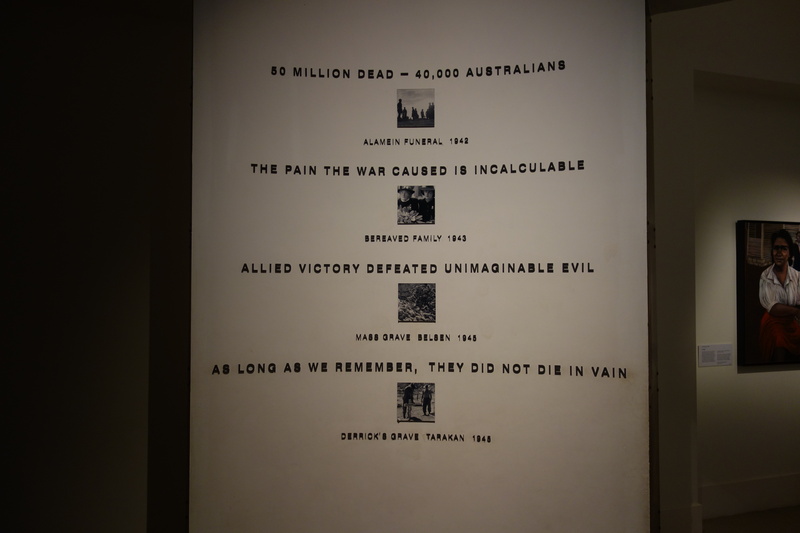 Those soldiers gave their lives to make Australia the great place that it is today. One of the best places in the world to be living with diabetes (then again, I might be a little biased on that one…) And a place where diabetes doesn’t restrict me from travelling and fulfilling my dreams. I think the least I can do to repay the favour is take the time to go and honour them. It hasn’t been the best start to the trip for me. After being in travel mode for most of yesterday, I probably ate less than I normally would. Which meant that come night time, my usual Lantus (long acting insulin) dose was too much and my Blood Sugar Levels plummeted overnight. Twice. I also had the WORST night’s sleep. I went to bed at 1.30am, woke up at 3.30am and again at 5.30am to deal with hypos. Add to that a dry, scratchy travel throat and Canberra’s below freezing temperatures, and you’ve got the perfect recipe for being sick. And considering that I haven’t actually been flu-sick in over a year and a half, it really does seem like bad luck! Anyway – that’s all the diabetes talk done for the day. 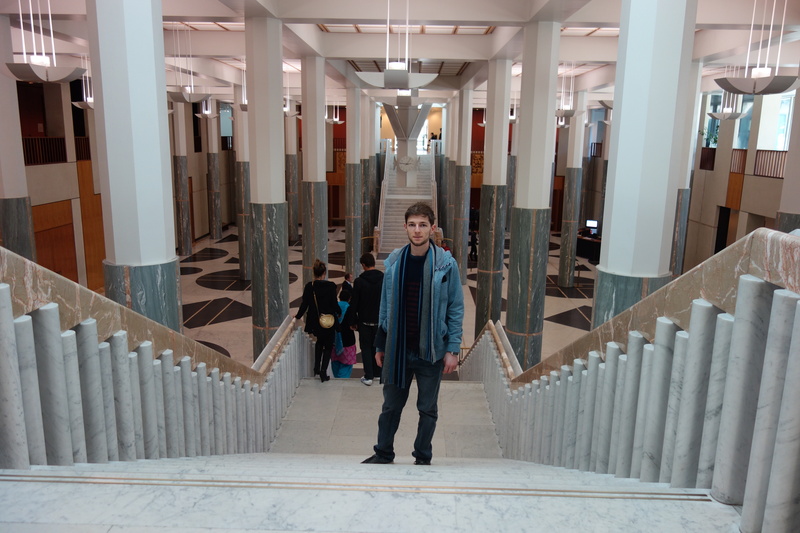 And I did manage to have a fantastic first day here in Canberra after all. I finally figured out why the Politicians decided to set up base in Canberra of all places. Its so cold here that most of us will leave them all alone here to fight amongst themselves (kidding!). But yes, the weather was absolutely freezing. Like, so cold that my fingers will go numb if they were out in that wind for too long. The day started out with a thick blanket of fog over the city. 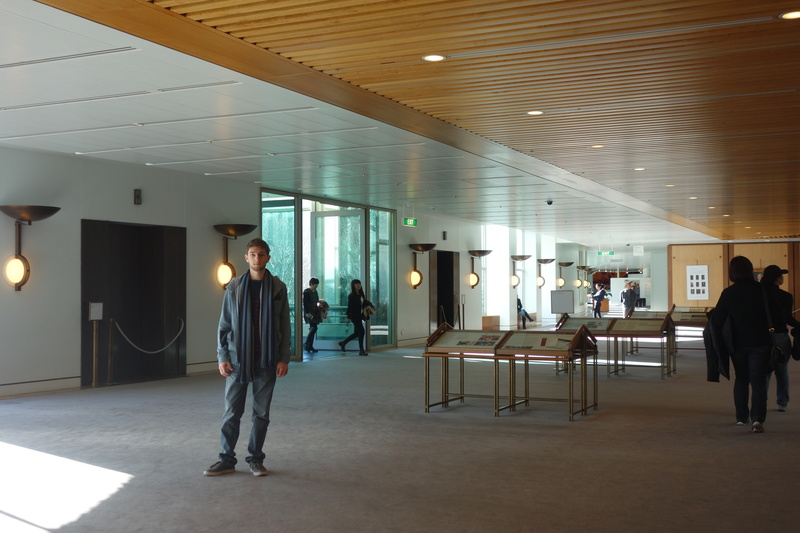 Which quickly cleared away to a cold but sunny afternoon spent at Parliament House. Getting in is like getting past airport security. And if you’re lucky, you might even be pulled aside for explosives testing! I must have beeped twice going through, forgetting to take off my belt and my insulin pen. I’ve only been there once before on a day trip from Sydney, so it was great to be able to take my time there this time around. Like standing where the reporters stand. Having a photo in that marbled foyer. 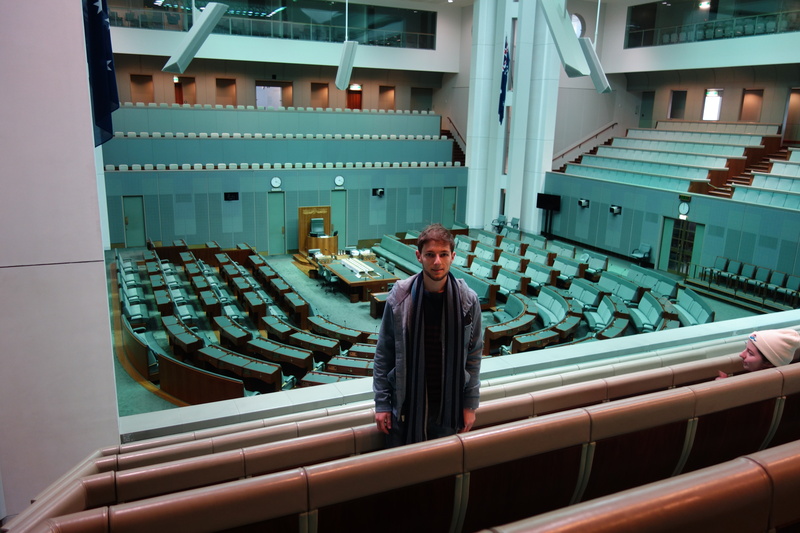 Checking out the sitting rooms where those politicians argue with each other all day. And walking those corridors that some of the highest paid public servants have walked. 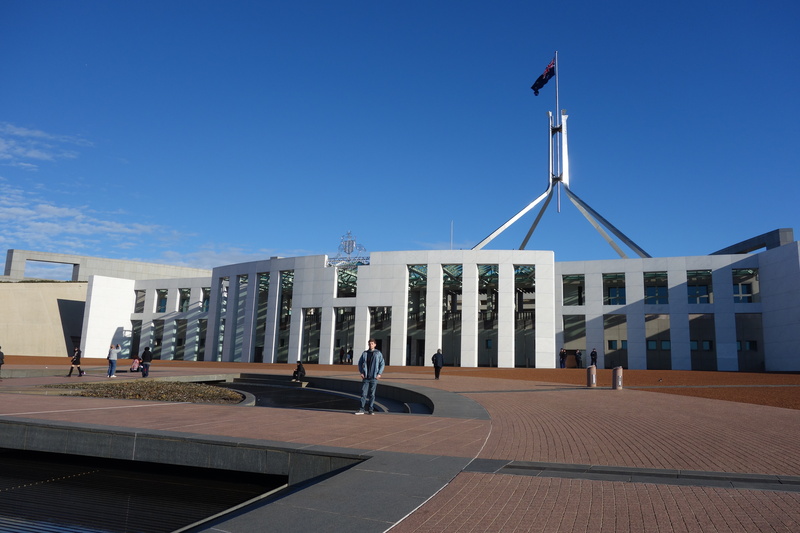 More importantly, this is the place where decisions are made and debated upon relating to me and thousands of other people living with diabetes here in Australia. Like access to subsidised diabetes supplies and equipment, and healthcare schemes like the NDSS, which help to deliver these resources. Not all of the outcomes decided here are a complete win for people like me, but overall I’d say I’m pretty lucky to have diabetes here in Australia. This afternoon did a lot to lift my spirits. I’ve gone pretty cautiously on the food and insulin so as not to go hypo again tonight. Now all I need is a good night’s sleep and a clear throat by morning and I’ll be a happy man. When I go travelling, I’m the first to admit that I tend to take a “break” from diabetes. Then again, I can’t literally take a break from diabetes. But I do put it on the back bench. I decide to enjoy all of the holiday eating that comes with travel, and just do enough to get by. I don’t pay too much attention to my blood sugar levels when I’m travelling. But I know there is a lot of extra bolussing. Lots of spikes and lots of surges. Diabetes “Rest” Mode. If there is one thing I do hope to achieve from this trip, its to be a little more sensible. I don’t exactly enjoy watching my BGLs surge after that massive lunch and then having to fix those nasty lows that come afterwards. I don’t enjoy walking around uncertain of where my Blood Sugar Levels might be at this point in time because of all that spontaneous eating. I want to tuck into some good holiday food, but I also want to be sensible at the same time. I have had a LOT of conversations about this trip with others over the last couple of weeks. 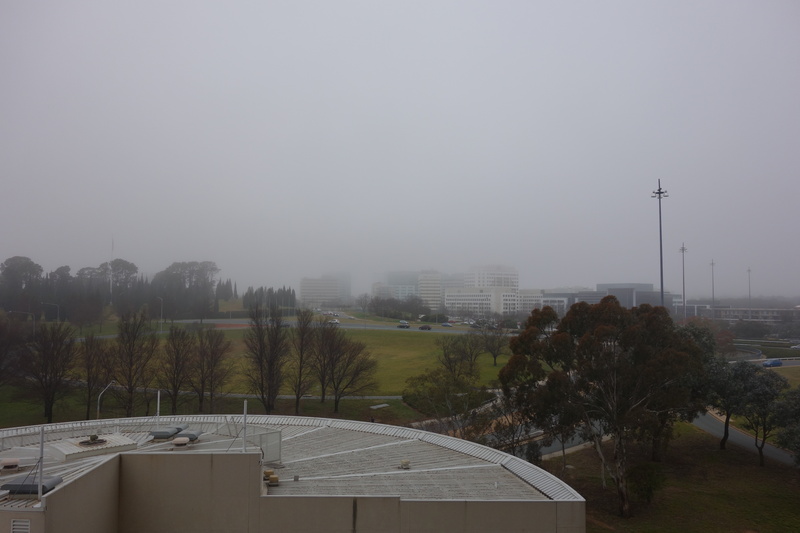 And the thing that everyone loves to remind me of is just how cold Canberra is going to be at this time of year. Over and over. I say bring it. There’s one particular conversation that did stand out to me. I was talking about travel with a friend at work a few weeks ago. She also happens to be jetting off on the same day as me, and we’ve been counting down the days together for weeks. “Think of all the wonderful sights you’ll see in your lifetime,” she said. We both agreed that we weren’t big on travelling for long periods of time. That we both missed the comforts of home, and that we would get sick of eating out all the time while on holidays. I brought up the fact that I had diabetes, which did make eating out a challenge. “But you walk around a lot and exercise, won’t that help with your sugar levels?” She said to me. “I have type 1 diabetes. Sugar has nothing to do with it. My body just can’t process most of the foods that I eat,” I replied. No resentment here. It’s just one of many examples of how much type 1 unawareness we have in this country. Even people who know me, who talk to me everyday, still don’t get it. They think that somehow I got this disease because I was unhealthy. But anyway, fast forward to now. It’s taken me ages to get into that holiday headspace. 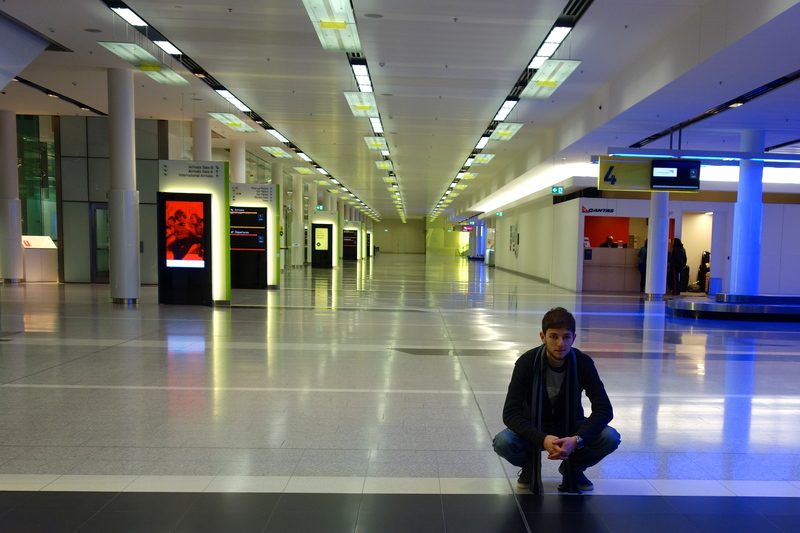 And its finally hit me, sitting at the airport (which looks WAY too deserted to be the Capital of Australia). The holiday (and much cooler) me has taken over, ready for some new adventures. I’m currently packing for a much needed holiday. And as I’m putting things into my suitcase, deliberating, taking things out and adding them in again, I’m reminiscent of how much my attitude towards diabetes has changed since the last time I travelled. Two years ago I would have just packed the bare necessities and prayed that I wouldn’t end up like one of the survivors on Lost. Enough supplies to get me through the two weeks and nothing more. I probably would have left the lancets, ketone strips and spare meters at home. I wouldn’t have taken kindly to those ‘friendly’ reminders from Mum and Dad. I would have scorned at the suggestion of finding some kind of travel accessory to carry my diabetes stuff (and today I’m honestly considering it). And I almost certainly would have chucked a tantrum at my Dad announcing to the world that I was carrying diabetes supplies at the airport (then again, I think today I still would). I don’t know what’s come over me. Maybe I read too many dBlog Week posts about people hoarding their diabetes supplies. Maybe I’m remembering Alice running out of insulin and passing away in Under the Dome. Or maybe, just maybe, I’m becoming more mature and beginning to take my diabetes more seriously. I’m only travelling within Australia, so I don’t need to go too crazy because access to supplies is basically identical to here at home. But if I were going overseas or on a longer trip, I would definitely need to consider packing more or what the accessibility is like in another country. I will stress that this is a rough guide to domestic travel within Australia, based on my diabetes, and is in no way medical advice. First up, the obvious. 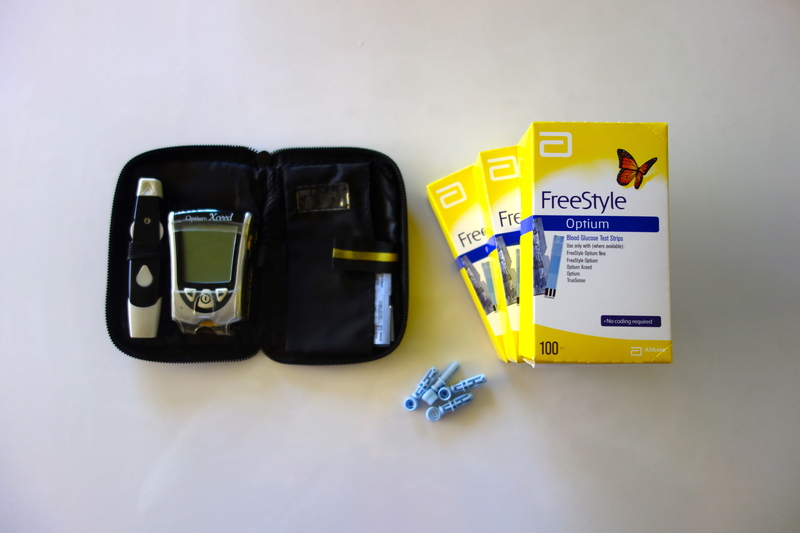 Blood Glucose Meter, Lancing devices that I don’t change often enough and Test Strips. I need only hit the history button on my Blood Glucose Meter to tell me that I tested 128 times in the last 2 weeks. I’ve packed 6 boxes of 100 test strips (which I’ve squeezed into 3 boxes), which is roughly triple the amount that I need. Also in my pack but not pictured: a box of ketone test strips and spare meter batteries! Another obvious, Needles and Insulin. I will pack the Insulin in the boxes they came in, with the pharmacy sticker that has my name and details, just to be safe. 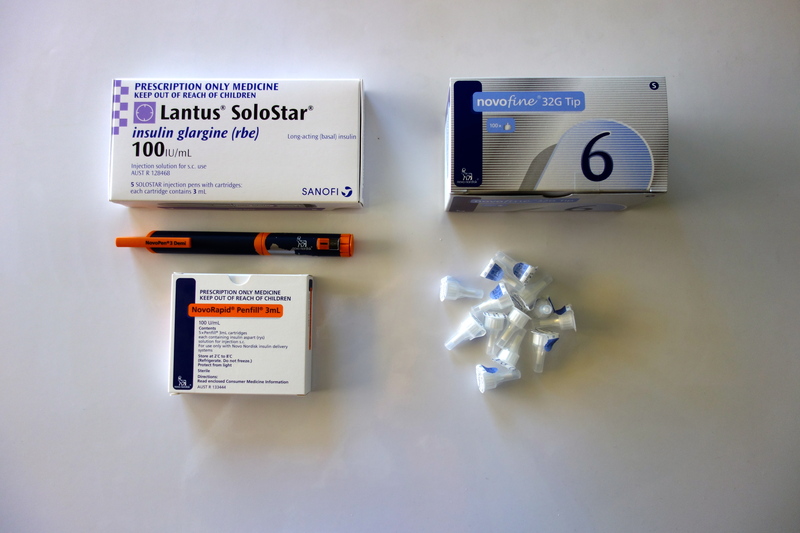 My Lantus (long acting insulin) pens last me ages, so one box should be more than enough. And one box of Novorapid (short acting insulin) cartridges should also be more than enough, even after factoring in all those goodies I don’t intend on eating…But I’ll probably pack a second box just for some extra security. My insulin will last me the length of my trip out of the fridge. If I were planning a trip longer than 30 days, I would need to consider purchasing an additional supply over there. 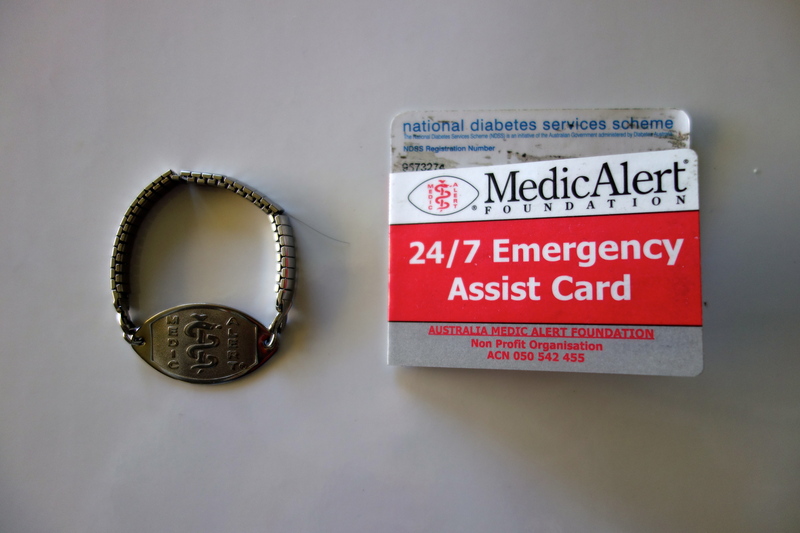 My medic alert bracelet that identifies me as an Insulin Dependent Type 1 Diabetic. The bracelet that I always conveniently ‘forget’ to wear. I’ve also got my Medic Alert Wallet Card. And, my National Diabetes Services Scheme (NDSS) Card, just in case I need to purchase any extra diabetes supplies on my travels. 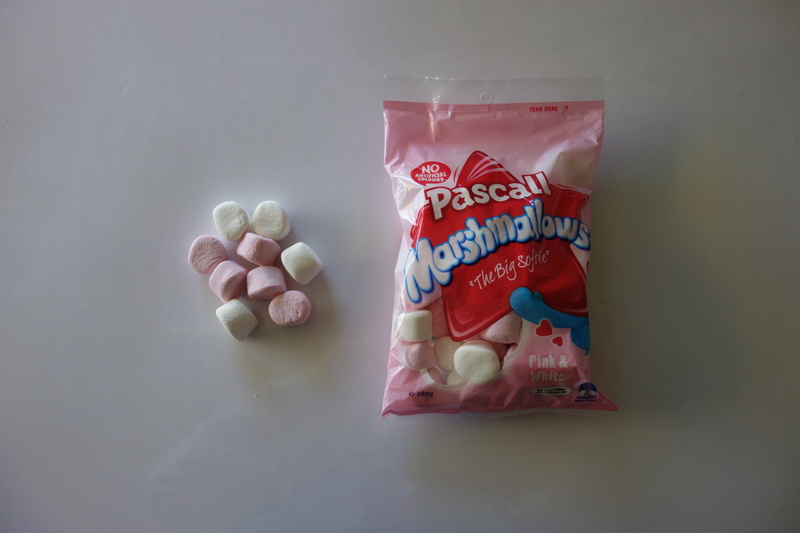 Marshmallows! Definitely my favourite new hypo treatment – soft and easy to eat, rapid acting, no jelly bits sticking to my teeth and no horrible dry sugar aftertaste on my tongue – yum! And a letter from my endocrinologist, confirming that I am a diabetic carrying supplies and not a drug dealer. I’ve never been asked to present it when going through airport security, but its better to be safe than sorry. I’ve also got a spare prescription for insulin, just in case something does go wrong and I need it on my travels. 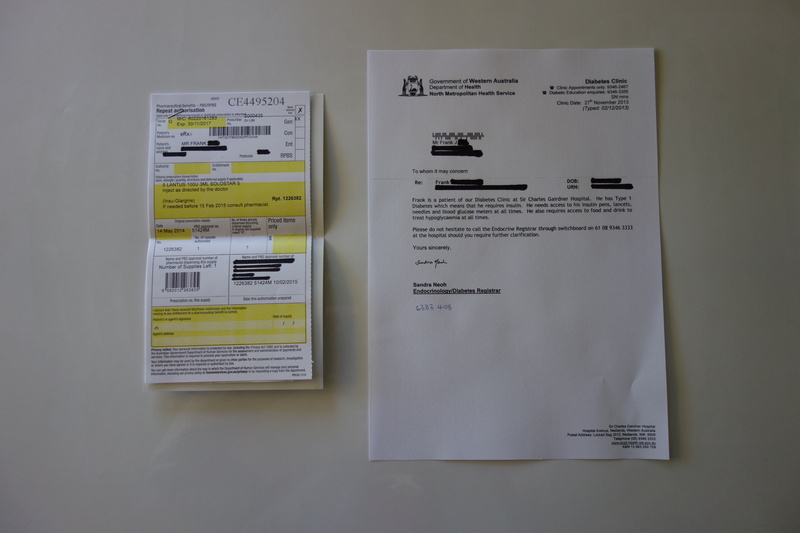 I usually carry these documents in a clear zip lock case so that they don’t get crumpled, wet or dirty amongst my other clutter. Who the hell is this crazy person I’m writing about? Anyway, serious work done and now to start packing all the fun stuff! 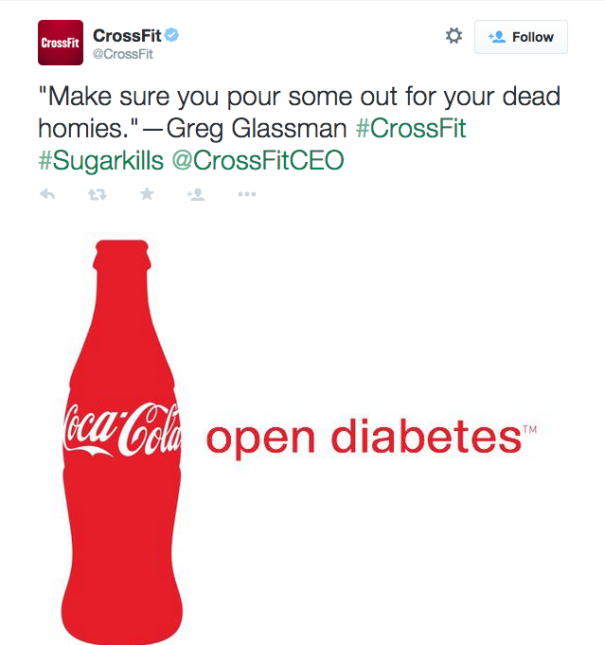 I must say that I was rather offended by your recent social media posts claiming that sugar causes diabetes. I don’t know if you realised, but there are actually TWO completely different types of diabetes. While a diet high in sugar may contribute to type 2 diabetes, there is actually another type of diabetes that has no definitive cause. Its a little thing called type 1 diabetes. I live with it. And I manage it, to the best of my ability. Every. Single. Day. And there are thousands and thousands of other, mostly young people, who develop this disease each day. There are young children, even babies, who get this horrible disease. There are concerned parents and loved ones who take on the emotional stress of this disease day in, day out. And please know that they did nothing wrong to deserve it. They weren’t lazy children. They did not get it from spending too much time in front of the television. They did not get it from eating too much junk food. They did not get it from not playing outdoors enough. And they most certainly did not get it from eating too much sugar. Please know that you attach a stigma to people living with type 1 diabetes. Just one of many stigmas we already face when living and dealing with diabetes in our day to day lives. You are helping others to make assumptions and judgements about me, and about people like me. Assumptions and judgements that are not true, and will have an impact on my own personal feelings and the opportunities that will come my way in life. And to be completely honest, I’m insulted when I have to hear such disrespectful and untrue statements from companies like yours. You make me feel about this big. And I worry for all of the young, impressionable minds. To the individuals out there who are struggling with the physical and emotional aspects of this disease right now. When they have to hear messages like this, its probably enough to make them give up hope. To stop trying. To stop fighting. To stop aspiring. But what bothers me most of all is your ignorance. Any other company would acknowledge that they’ve done wrong. I could even accept that this marketing message wasn’t thought through well enough. But your total ignorance and willingness to continue defending this message is an absolute disgrace. I, along with every other type 1 diabetic in the world, are waiting for an apology. Even just an acknowledgement that you’ve done wrong would be greatly appreciated.